"Sir Henry Englefield, an amateur geologist, describes the spot in the following language:-'The scenery of this Bay is very superior to that of any other part of the island. The chalk forms an unbroken face everywhere, nearly perpendicular, in some parts most formidably projecting, and the tenderest stains of ochrous yellow and greenish moist vegetation vary without breaking its sublime uniformity. This vast wall extends nearly a quarter of a mile, is more than four hundred feet in height, and terminates by a thin projection with a bold broken outline...Small vessels often lie in this bay for the purpose of loading chalk and sand, and they serve admirably to show the majestic size of the cliffs, under whose shade they lie diminished almost to nothing. 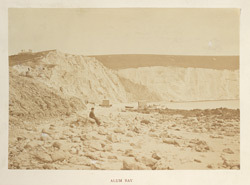 '...Alum Bay takes its name, it is usually said, from alum having been found on the beach. However this may be, its coloured sands are certainly the wonder of the Isle of Wight."